A NEW series of pH and reference electrodes from Sensorex promise the performance of mercury chloride (calomel) electrodes but without the mercury and its associated hazards. The new ‘calomel-free’ electrodes are available in a glass or thermoplastic body, and feature a silver/silver chloride (Ag/AgCl)-based double junction reference. They incorporate a silver ion trap to prevent contamination with silver-sensitive samples. The reference output is adjusted to deliver the same output as calomel electrodes using a silver chloride reference. Electrodes are available in a combination model featuring a pH cell and a reference cell in a single body, with separate reference half-cells also available, and in both sealed and refillable reference styles. Gel-filled sealed references are maintenance-free, while refillable designs offer extended electrode life. Measurement range of is a full 0-14pH (0-12.3pH without Na+ error) with a response speed of >95% in one second. They feature an isopotential point of pH 7.00 (0mV), an offset of +/-0.20pH and a span of 97% or higher. The electrodes operate up to 60C. Calomel Free Electrodes are also available in several different length and diameter requirements, including the popular 12x150mm Epoxy Body Combination pH Sealed Reference. 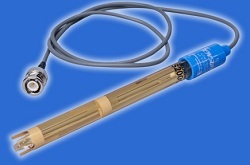 All Sensorex electrodes are supplied with a 76cm cable, soaker storage bottle or soaker cap, and BNC connector, and are suitable for virtually every meter on the market today.